I know I recently posted another tuna recipe, but they had some yellow fin the other day that looked pretty decent for Iowa (mind you, not the blood red you get when it comes fresh out of the ocean, but hey, beggars can't be choosey). Turns out, I am glad I got it. It was delicious. 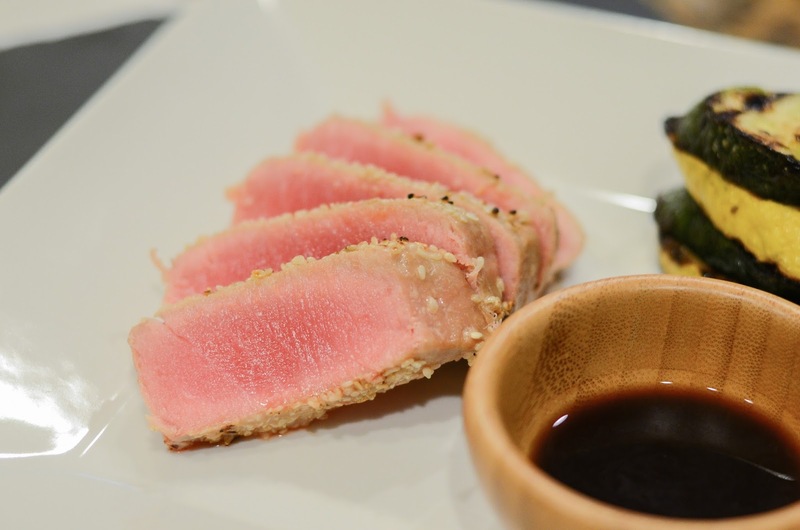 Fresh, mild and slightly sweet like yellowfin should be. Yellow fin, if fresh enough, doesn't need anything to make it taste better. Simplicity is best. The ONLY exception would be when it is used in a spicy tuna roll. I mean, really, you can't go wrong when you are adding mayo and sriracha, right? Anyway, I need seared tuna with a sesame crust would be perfect. This is how I make mine. Preheat your grill to high. The temperature on my grill usually overs around 700 degrees. Whisk the aminos and oil together. Lightly dry the tuna steaks with a paper towel to remove any built up moisture. Brush one side with the amino and oil mixture and then coat with sesame seeds, pressing the seeds slightly with your hand. Lightly salt and then turn over and repeat on the other side. Place the tuna on the grill and sear 3-5 minutes. This all depends on the thickness of your tuna steak. About 1/8 of the edge all around should be cooked, leaving the majority of the steak rare. You can cook it more if you aren't used to a rare tuna, but I wouldn't cook it anymore than having the edges around 1/4. If you can't eat yellow fin rare, or medium rare at best, don't even waste your money buying it. Capiche? Dip in some coconut aminos if you choose. Sublimely delicious and foodgasmic this is.